Yes, you read me right! I have been crazy enough to pick up Sweets for all 26 days of April. I picked up to do A to Z of Maharashtrian Sweets this April for a Journey through the Cuisines. Read the rules to know how the theme works. Before I start my Journey through the Cuisines. let me give my vote of thanks and speech, lest I miss out to do later after all the overload of sweets! Maharashtrian Cuisine is one of my favorite cuisines. We have picked up this cuisine many times for Indian Cooking Challenge. However, my main motivation was the goodie bag that Pradnya gave us all when we met for BM#50 Celebration last year. She had so painstakingly packed us some delicious homemade stuff from her state. I was planning to make an elaborate thali for September, which never got done. While all my buddies finalized their theme, I was still clueless, until I landed in this place! Gosh looking at that platter, something clicked and the search never stopped. I almost got my entire list of A to Z from Amu’s Recipe, with some missing. Since it was going to be Sweets, I knew I had to plan it properly. Well, I also knew it was never going to happen. The cooking for this marathon, as usual, started just a month ago, with weekends being a marathon cooking. While I knew making these sweets will not be a problem, my valued customer, Hubby dear was traveling. So I had plan my cooking didn’t clash with his travel plans. Since Konda was busy with her exams, she couldn’t help with step by step pictures, however, I was able to rope her in for enjoying these sweets and, of course, I have my colleagues as well. I can’t thank Pradnya enough for the help and for patiently answering all my queries on the different recipes I picked up. She even suggested recipes for some of the tough alphabets. 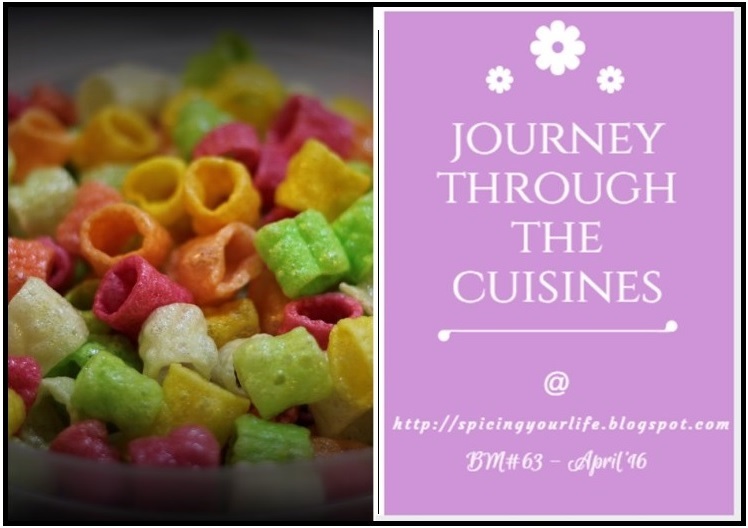 Some of the Maharashtrian blogs that I looked up were Vaidehi Bhave‘s, Meera’s, Amu’s, Bestmarathirecipes. Individual posts will have the source mentioned from where it was adapted. During this course of cooking, I even reached out to few other bloggers, who have been so helpful in assisting in their recipes. Thank you all for sharing your knowledge on Maharashtrian cuisine so generously, which enabled me to enjoy in my own kitchen! All recipes are adapted from the source with due credits, I may have modified some based on personal preference though it wasn’t much. I also felt many of the recipes were universally Indian. So there weren’t many hurdles on that aspect. No, I will not attribute any weight gain on self on this series, I have only tasted a tiny bit of all dishes while shamelessly indulged in some of the best. Another big push was one dish that was already cooked, before planning on this cuisine. While going through the different recipes, I realized I have one draft. Sadly that was without step by step pictures because Amma had made it. Can you imagine a venture into a new challenging cuisine happened because I have one less dish to cook? Yes, I knew we were a crazy bunch! And clicking final pictures! Yes, I never realized sweets would be so tough as drinks! So if you see an overload of almonds and raisins, blame my overworked brain and lack of creativity. I do not like food being thrown on the ground. So I have scattered nuts around the plate. I have become nuttier through this Journey of Cuisine. Blogging Marathon # 30 – 3 Day Marathon for 4 weeks! Looking forward to a sugar high month Valli :-). Good to know your theme..
That is an awesome theme Valli. Looking forward to all you sweets..
Beginning on a sweet note valli !! Waiting to see your posts! !! looking forward to all your delicious sweet recipes Valli. For a second I checked today's date :)nice idea starting intro. a day before…. wow what a theme – you outdo yourself every time – I bow my cap to you lady! Wow Valli such an interesting theme.Looking forward to seeing all your Maharastrian Sweets.